Today we’re excited to announce some changes to the Corilla pricing model. For the majority of users this will mean more features and lower prices. That’s a total win for you. For our larger customers there’s a more significant price rise to invest in greater support and reporting features that are important for this level of content collaboration across teams. That’s more a month for a lot more service and support. If you’ve been using Corilla for a while you will be familiar with this kind of candour. Further on I will explain why we’ve made these adjustments and what we learned that inspired them. In the meantime here’s a summary of changes and impact. More awesome for less dollars. Unless you roll large. The small team tier is now totally free. This will empower teams of up to five users to create and publish an unlimited amount of content. That includes topics, collections and even the new knowledge bases. Bring your own Google Analytics and brand assets to publish with our beautiful and growing styles. This tier is perfect for startups and smaller content teams. It lets you get up to speed quickly with our custom templates and is popular for both internal content and public posted user documentation. There’s no quicker end-to-end publishing workflow from writing to managing to publishing for a collaborative content team. If this is you then go get started today. 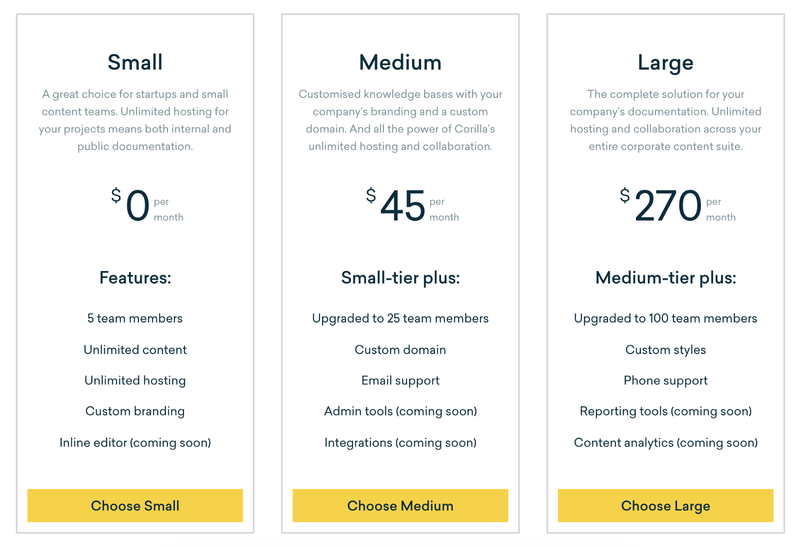 The medium team tier expands up to accommodate 25 users and introduces professional features such as custom domains and priority support. We’re also rolling out integrations and administrative tooling for teams at this size. This level has been popular for teams that grow rapidly into the collaborative workflow that Corilla is so effective at enabling (often replacing two to three other legacy tools in the process). Medium teams tend to not only publish multiple sets of public user documentation, but increasingly revolve around the power of internal content publishing. Knowledge management never felt so central. Make your team this happy today. The large team size have increased in cost as we begin rolling out advanced reporting and content analytics as applicable for enterprise content teams. Large teams have the ability to fully customise their published output, effectively white labelling Corilla for their product or corporate brand. We’re working closely with our large team customers and providing the realtime support required at such scale. We have also been developing customised onboarding experiences at this level and will continue to scale out the overall training and customer success strategies. Which then empower our overall Corilla user base at every level. Empower your organisation and smash those knowledge bottlenecks now. As I mentioned earlier we take a candid approach to our updates and overall company culture. We’re too busy solving the problem of collaborative content creation and publishing to worry if our marketing is “professional enough”. We think transparency is a better form of marketing, and as we’re in this for the long run, consider it critical to show our evolution as both a company and a product. In this evolution we’ve made some interesting discoveries about our customers and the industry as a whole. Corilla itself is a product of this evolution, from my days sitting at Red Hat working on internal content tools to solve the challenges of collaboration within the DocBook XML paradigm, through to our time at NUMA in Paris where we made the pivot to Markdown and went all-in on user experience. We think the tool most of the team actually enjoys using is more powerful than the expensive legacy license that only a handful of people begrudgingly use. In the last twelve months we’ve expanded to now cover 85 countries on the planet. That’s a lot of diverse customer use cases. And that’s a lot of positive reinforcement when we get things right. But even more useful when we get things wrong. Number one on that list of hard lessons is that we were underpricing our large team tier. Like many companies that begin as startups, we rushed to acquire our first thousand teams as a form of validation. All the startup books and mentors on the planet can’t fully offset this tendency to underprice while pursuing gross coverage. It’s also an early challenge for the team to set fair margins that allow for organic and sustainable growth, while also understanding both the implications of market signals, and supply side cost. To solve this we took our favourite approach to solving problems. Asking the customers. Thanks to the deep involvement of larger teams in our company journey we were able to work backwards from their requirements and some candid conversation about cost and value based pricing. Which is a constant reminder that we’re not in the game of marketing a product to customers, but building solutions from within our community towards a greater common goal. For our medium tier customers it’s business as usual. We’ve found this to be the most popular position for the majority of our customers. What began as a technical writing tool evolved into collaborative content creation and publishing workflows for teams. And our users grew with it. The popularity of the medium tier drives our stability as a company and enables the pace at which we’ve been shipping weekly updates right across the platform. If this is you — thank you for enabling this journey. The small tier rolling into a free account was something we explored carefully. With the majority of our core users moving quickly to the equivalent of the medium tier, we looked at pricing this down to something “cheap but not zero”. Ultimately the decision was made by a realistic look at our own behaviour as a company. Specifically how often we were jumping into Stripe to apply a “secret coupon” to open source companies and startups that were keen to “just get on with it”. Even companies using Confluence or Git-based tools were asking for access to round trip their content — they just wanted to write. So with the combination of being able to grow financially as a company with the success of the medium and large tiers, plus the reality of what we were doing for startups and small teams anyway, it just made sense to open up the entry point. While this will leave some money on the table, it will empower far more teams to utilise what is easily the best end-to-end collaborative content tool on the market. The world doesn’t need more “note taking” apps. Wikis are where good content goes to die. And watching storage companies desperately acquire “the other Google Docs” is just painful. None of it is helping those of us whose careers rely on realtime collaboration on often technical or time-specific content. Corilla is continuing to solve these problems. With the addition of on-demand discovery of version controlled content in a central repository, matched by user-specific dynamic content re-use (and my favourite feature, the automatic screenshot library). With the recent release of our new knowledge base, updates to the UI and this pricing update, I’m really proud of the team and excited to be continuing towards these goals with such an amazing community around us. Thank you. Let’s get writing.